Oaxaca's 560 communities are represented in this annual dancing event in Oaxaca. One group travels around Mexico to bring the tradition to other states. VIDEO: Watch this short video of the guelaguetza performance in Chapala, Jalisco. Oaxaca’s guelaguetza is a cultural dance and music event that takes place each July in Oaxaca City. The two performances bring together dancers from Oaxaca’s eight regions and the hyper-localized traditional dress and customs of its 560 municipalities. Since 1998, the Oaxacan Renaissance Group of Professor Cesar Palacios Ayala (Grupo Renacimiento Oaxaqueño del Profesor Cesar Palacios Ayala) has traveled Mexico to bring the guelaguetza (wey-lah-GEY-tzah) to other states. The professor started the group, he says, to rescue Oaxaca’s Zapotec culture and traditions which today are nearly extinct. He spent years traveling Oaxaca, taking notes and learning the dances from each region, as well as forming a collection of each area’s outfits, which has grown to over 300 trajes. Each piece is completely handmade, with the most elaborately embroidered dresses taking six months to make, six hours a day, including Saturdays and Sundays. Earlier this month the dancers came to Chapala for the first time to perform some of the danzas from Oaxaca’s extensive canon of balet folklórico. One of the amazing things about Mexico is that there are so many regional traditions, holidays and foods, which are typical of small regions of the country. In Oaxaca, which is just 4.7% of Mexico’s land, this diversity is multiplied ten times over. While entertaining the crowd during one of the costume breaks, the Oaxacan Renaissance Group’s master of ceremonies jokes about how diverse his state is by comparing each of the state’s 560 municipalities to chicken recipes. With so many communities, each with its own particular way of dress and customs, not every municipality can be represented during the annual guelaguetza in Oaxaca City, which changes its lineup a little bit each year. Some of the dances which the Oaxacan Renaissance Group brought to Chapala included the Little Bull of the Highland, the Dance of the Devils, the Pineapple Flower, and Syrup of the Valley. A dancer from Oaxaca, Mexico, performing the dance Jarabe del Valle (Syrup of the Valley) during a performance of the guelaguetza in Jalisco. The performers of this song, Jarabe del Valle, dance with a basket balanced on their heads. The Jarabe del Valle dance comes from the city of Oaxaca. The balancing of canastas, or baskets, is featured in a number of dances from Oaxaca. The baskets lined up on stage before the performance. A dancer from Oaxaca, Mexico, performs the Dance of the Devils (danza de los diablos). A dancer from Oaxaca performs the Dance of the Devils (danza de los diablos). VIDEO: This video shows you the Dance of the Devils (Danza de los Diablos) during a performance of the guelaguetza in Oaxaca City, where the event is officially held each July. The Oaxacana Renaissance Group who visited Chapala earlier this month also performs the event year-round across Mexico. Dancers from Oaxaca in Chapala, Jalisco, Mexico. A dancer from Oaxaca, Mexico, during a performance in Jalisco. Dancers from Oaxaca, Mexico, during a performance of the guelaguetza in Jalisco, an indigenous dance festival that started in 1932. Dancers from Oaxaca, Mexico, perform the guelaguetza in Chapala, Jalisco. A dancer gets ready for the Baile Flor de Piña (the Pineapple Flower Dance), a 50-year-old dance representing the region of San Juan Bautista Tuxtepec. Each year for the festival, young women who meet certain requirements are summoned to participate in the dance. They must be tuxtepecana (from the region of Tuxtepec), single, know how to dance, be less than 22 years, be of medium stature, and have their own hupiles (blouses). A dancer during a performance of the guelaguetza, an annual cultural dance event from Oaxaca. VIDEO: This video shows the Dance of the Pineapple Flower (La Flor de Piña) during the 2017 guelaguetza in Oaxaca City. 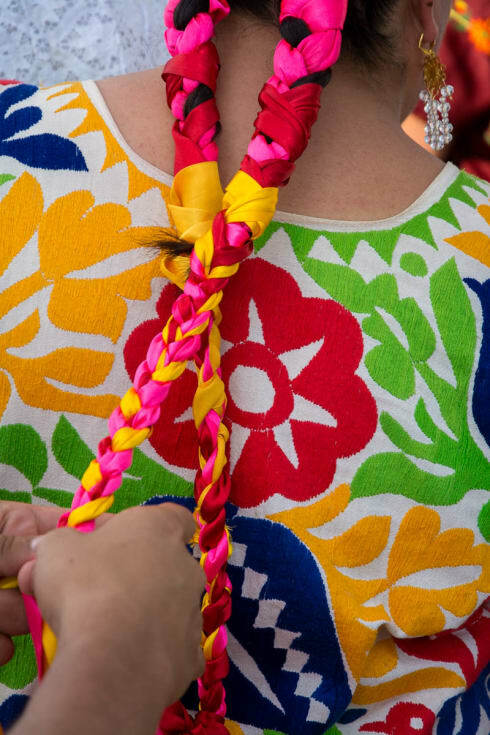 In Oaxaca, it’s common for indigenous women to braid fabric into their hair. A dancer during a performance of the guelaguetza, an annual event from Oaxaca which this group of dancers performs across Mexico. The performers dance El Torito Serrano (the Little Highland Bull), a dance where the women charge at the men, knocking them down and off the stage. VIDEO: This video takes you to the town of San Pablo Macuiltianguis, where the dance El Torito Serrano originated. See the dance as performed by its own town members. The performers prepare for a final dance just before the sun goes down. A dancer from Oaxaca, Mexico, with a basket during a performance of the guelaguetza in Jalisco. The dancers perform Jarabe Mixteco (Mixteco Syrup).